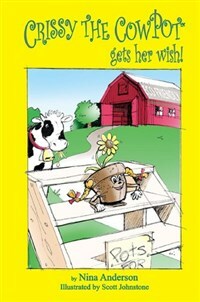 This is the eco-friendly story about Crissy the CowPot™ and how she got her special friend! Through Crissy's wonderful tale, children can learn how one farmer went “green” and saved the environment. Nina Anderson is a licensed pilot and professional writer. After graduating from Monmouth College, Ms. Anderson embarked on a career in aviation that would span over forty years. With her experience in flying both commercial airline and corporate planes, Ms. Anderson has written several exciting books on aviation including The Backseat Flyer and Eliminating Pilot Error! The Final Step in Flight Training. Ms. Anderson lives in Massachusetts and still loves to fly airplanes.